The U.S. Department of Labor released its final statistics on job fatalities in 2011 today. Fishing was once again the deadliest occupation, with a fatality rate 36 times that of the national average. 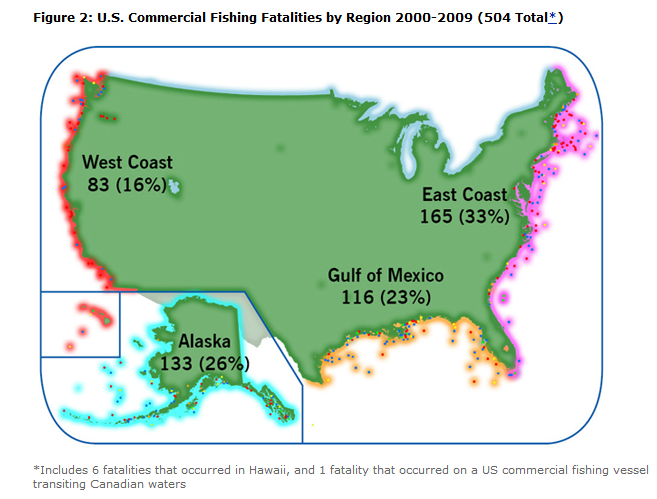 Fishing is consistently the most dangerous American occupation, year after year, which is surprising to many people who do not fish or are not close to the industry. What’s the Deadliest Job? Police Officer? Fire Fighter? Fisherman? NPR’s Planet Money created a compelling graphic to illustrate how different jobs compare in terms of the risk of getting killed on the clock. While police and fire fighters may come to mind as being the deadliest occupations, fishermen actually have the highest risk per 100,000 workers of losing their lives. Fishing is inherently a dangerous profession, but there are many ways to make it safer that deserve attention. One is catch share management, which ends the race to fish and relieves some of the pressure on fishermen to be on the water in the worst weather because they’re afraid the fishing season will be cut off. Read more about the impact catch shares have had on safety here. The Center for Public Integrity teamed up with NPR and WBUR to report on the significant dangers of the commercial fishing industry. The U.S. Bureau of Labor Statistics has found that commercial fishing is the deadliest job in America.In 2010, fishermen faced a risk of dying on the job 42 times higher than the average worker. 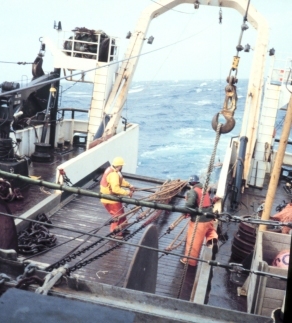 Fishermen hauling in a trawl. Today, fishing once again topped the Bureau of Labor Statistics’ list of most dangerous jobs in the U.S. In 2010, commercial fishing had a fatality rate per 100,000 full-time-equivalent employees 33 times the average rate for U.S. workers. 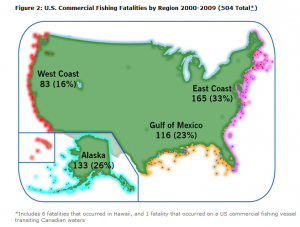 Although fortunately fishing’s fatality rate did decrease from 2009, it remains true that fishermen faced the highest chance of dying on the job compared with other occupations in the U.S. Many things make fishing dangerous, but the way we regulate the industry can make things worse. For example, regulators often manage fishing by limiting when fishermen can be on the water, such as by setting short seasons, allocating a limited number of days at sea or shutting down a fishery when too many fish have been caught. In order to catch enough fish to stay in business, fishermen must race to catch them before others do, which can lead to fishing in dangerous weather conditions, keeping exhausted crews on the water and overloading boats with excessive gear. All of these methods maximize catch in the short term but risk lives.